It works with a stock Raspbian, you only need to put a dtblob.bin file to a boot partition for enabling second camera. It means you can use raspivid, raspistill and other traditional tools for work with pictures and video. JFYI stereo mode supported in Raspbian from 2014, you can read implementation story on Raspberry forum. Before diving into the technical details let me show you some real work examples. You can download original file here. You can download original captured video fragment (converted to mp4) here. Now – to hardware part. Power switch: Yes! No more connect-disconnect MicroUSB cable for power reboot! That’s all that I wanted to cover today. If you have any questions I will be glad to answer. Cool! Has been on my to-do list for too long. How did you solve the time sync issues between the cameras? I looked at this some time ago. 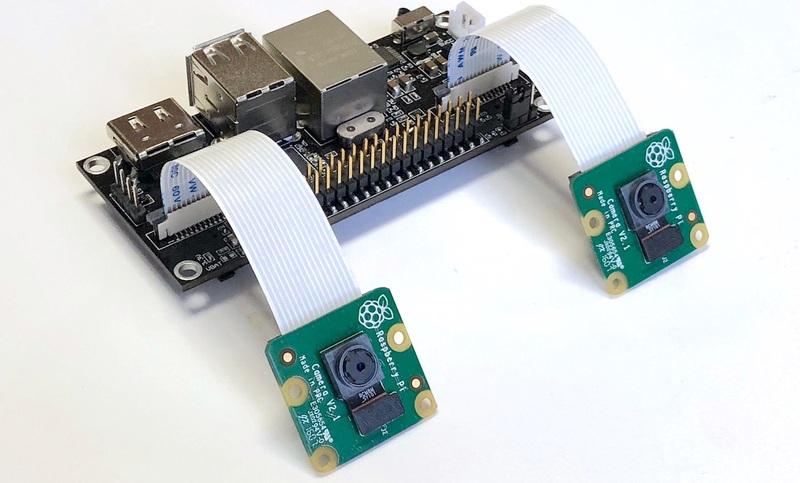 iirc the sync pins on the Pi cam aren’t exposed, and you can’t deterministically trigger the image capture because of how i2c is implemented. Auturgy, sync question was the main point for us to analyze when we start do develop the first generation of the board on CM1 in 2015. On Pi forums user 6by9 mentioned this question several times in stereoscopic forum thread. There are no ability to absolutely sync them, but usually capturing time differs in just few ms. I was afraid of risk of error accumulation during long-time capture, that's why we did a lot of long-run tests. We make HD image capture, stream it over UDP and then analyze it (usually for 48 hours). We did not find any issues causing depth map artifacts. have you tested with a moving camera? The other issue is being able to accurately time stamp the images: there is a difference between when image capture is commanded and when it is actually executed, which is not consistent (between the cameras or between frames for a particular camera). For applications such as VIO this creates a lot of noise in the results. Of course yes, moving camera is our main usage scenario. The only case is a low-light conditions, you need to set FPS priority while capturing video. At that moment we finished hardware part of a project, and now focused on software part. Nearest step is ROS and obstacle avoidance. We prefer to make a practical stress-tests to find all unstable parts in our solutions. Auturgy, what is your project on CM3? Did you try to make own PCB or used Pi's devboard? Nice project! You write you support HDMI input camer. 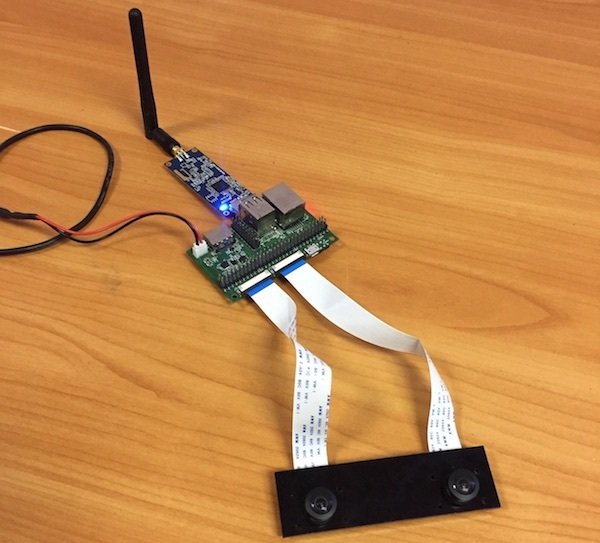 How do you connect the camera to the board? For HDMI we use Auvidea HDMI to CSI2 adapter. Unfortunately Toshiba chip in this adapter has only unofficial support, that's why it is impossible to use two HDMI capture modules at once. We use one HDMI in and one camera to make two independent video streams. Both. Custom carrier was designed (minimalist: basically just exposing USB, sdcard, the csi’s and uart, with some power management), but not fabricated. Started with the dev board. "Both. Custom carrier was designed (minimalist: basically just exposing USB, sdcard, the csi’s and uart, with some power management), but not fabricated. Started with the dev board." Why do you stopped? It does not fit your tasks? Our first generation (on CM1) was for stereo livestream only, and also has additional 16PWM chip onboard. Current generation more focused on CV. Auturgy, if you will reanimate it - let's compare our results and share experience!